Touchpad's right click button not working. I have a dell laptop and it’s fully updated with libinput and xf86-input-libinput installed. I have this issue where both the touchpad buttons are performing left click only. Pressing the right click button also just works as left click. I have a wireless mouse which works fine and two finger tap is also working. This issue happened earlier also but it got automatically resolved. It’s frustrating, having these minor bugs. How should I fix this? Are you running Gnome, and is it a recent update to Gnome 3.28? If so, there’s a new default “emulation” action for the mouse buttons. Go over to your system tweaks. 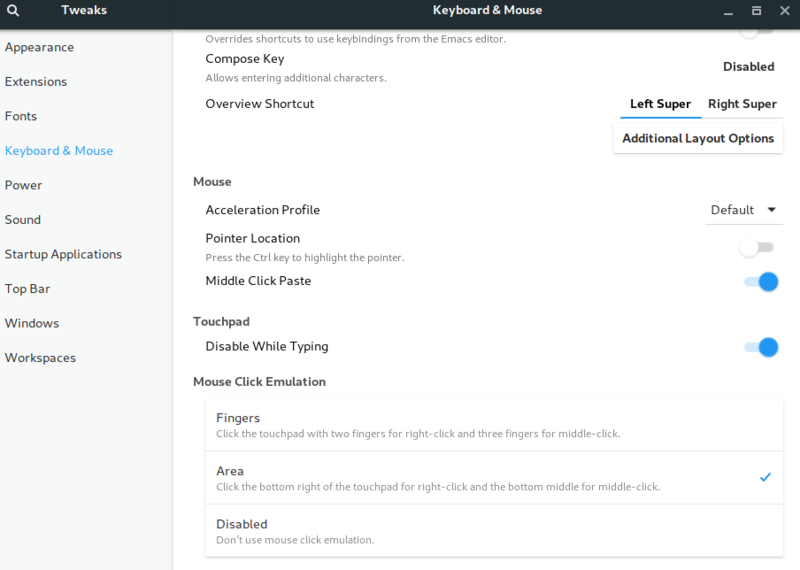 Under keyboard & mouse, you’ll see a section for mouse click emulation. Select “area” for traditional touchpad left/right click actions. Thank you so much! It worked. I had glanced over it thinking it would break the two finger tap for right click. But both work currently. Thank you.